Matias Dahl has analysed the history of OSM data and noticed some interesting patterns on the change in the amenity tag. It also includes some pretty cool graphs. Since December 3rd was International Day of Persons with Disabilities, Heise On-line reported about the recent developments in the wheelmap.org map. This OSM-based map allows users to add PoIs and to score them for wheelchair accessibility using a simple (“traffic light”) scale. Nikhilprabhakar’s OSM diary provides a fairly detailed description of how Mapbox have been working to improve the completeness of the road network in India. 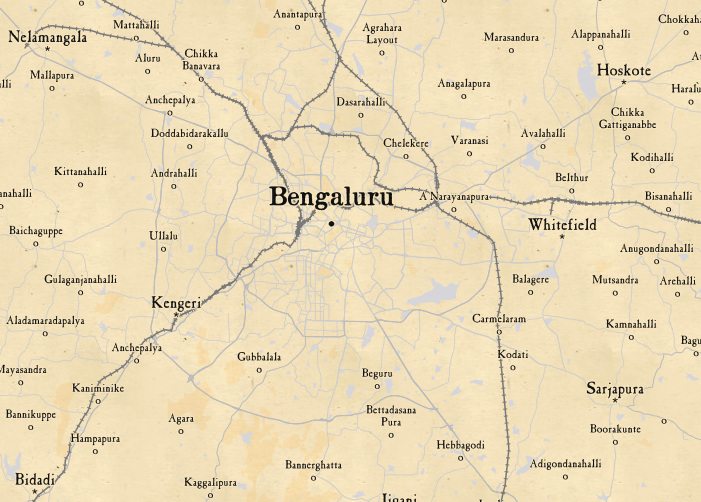 Also invites the OpenStreetMap India community to help in improving the road network coverage. A Mapzen blog encourages us to improve the awesomeness of OSM data by naming the un-named segments of roads. A tool is provided to help you locate the roads in your city that needs to be named. According to amb_santacruz’s diary OSM now contains 90% of the world’s roads. Others leaving comments on this claim, are more skeptical about it, but a link to the country-by-country data is provided so readers can judge by themselves. Haserbaba describes some problems he had (and cartographers before him) to properly map a zoo in Moscow. Joost Schouppe puts together some statistics on the Belgian mapping community. User SK53 evaluates the mapping of the Townlands in Northern Ireland by comparing OSM data with recently-released official open boundaries data. He estimates that not more than 1% of the OSM data needs to be corrected. Steve Coast is thinking of organizing an OpenStreetMap conference focused on the community. OSM Tasking Manager is looking for translators for it’s new release. User bdiscoe discovered (with a tool he wrote) the “most inefficient way in North America”. In Martijn van Exel’s diary we read about the beta release of a “conflation engine” tool which has been developed for importing data in Mexico but might have wider applicability. User capiscuas writes a blog about fixing Jakarta boundaries level 5 to level 9. Just in time for OSMF meeting Kate Chapman presented her report as Chairperson of OSMF. The treasurer’s report from Frederik Ramm was published just in time as well. New elected board members of OSM Foundation – Martijn van Exel, Ilya Zverev, Peter Barth and Mikel Maron. Saturday, December 5th the Annunal General Meeting (AGM) of OSMF took place online. Paul Norman published the results and https://blog.openstreetmap.org/ presents the new board. A Missing Maps Mapathon is being organized in Lyon on Friday 18th December to introduce OSM and HOT to new mappers. In the official blog of the OpenStreetMap Foundation the date for the State of the Map 2016 is announced. It will take place at the Free University of Brussels from 23 to 25 September. The event has already a website. Dermot McNally, an Epic Mapper from Ireland writes about how to find “the next generation of mappers”. The annual north-east monsoon that hit Chennai this November/December, led to massive flooding. More than 300 people were killed and 1.8 million fleeing the floods. The OSM community brought a flood map online. User pratikyadav asks for help to map, particularly the outskirts of Chennai. The task can be found here. dekstop’s OSM diary provides an interesting perspective on what provides satisfaction and motivation for various mappers. Specifically he suggests that HOT volunteers get “secondary benefits” from participation, for example from their social experiences. Pioneer is the second in a series of new map styles now available on Thunderforest (the first in series, Spinal Map, is described here). These styles, designed by Richard Fairhurst, for Andy Allen’s Thunderfrost project harks back to the days of pioneering railroad construction in the American West. Wikimaps have published a project proposal which aims to make collecting and displaying historical geographic data fun and easy for everyone. Old maps, images, historical data and common visualization techniques together will allow historical phenomena to be illustrated in Wikipedia. The project is collaborating with Open Historical Map. v2.37.0 of the OpenStreetMap-carto stylesheet was released on 1st of Dec and rolled out to the openstreetmap.org servers. Within a couple of days all tiles should show the new rendering. Full details of the new commit are provided here. The public transport in Stockholm, Sweden switched to OSM. (automatic translation) (via: User Jan Ainali). The German “Bundespolizei” (Federal Police) uses OSM. Australian GNAF (address) data to be released under open license from February 2016 onwards. The Open Data Portal of the Government of Moscow has published data of 147,000 buildings in Moscow (addresses, other details and polygons). In Sandered17’s OSM diary we can read about the the GRB database for Flanders which is a very large database of GIS data. It has been released under an Open Data Licence compatible with the ODBL. The Australian community has the explicit permission to use NSW Land and Property Information data. Simon Poole has created wheelchair presets for JOSM and Vespucci. MUX Lab have published code and nice demos for a series of animated map effects which can be used to highlight areas on leaflet-generated maps and to provide custom pop-ups on user interaction. Impress your friends with this screensaver provided by Alper Cugun which displays live editing of OSM. (You will need to be running OSX). There are many map styles and specialized overlays which can be added to Leaflet maps using the Leaflet Providers extension. Now you can view nice mini-maps of all these styles here. … geotrellis, a geographic data processing engine for high performance applications. … the “new” background in maproulette? Chronas is a history project linking Wikipedia to a dynamic map with a time slider. You can watch a youtube demo here. In an open letter Mapzen CEO, Randy Meech, asks Audi, BMW and Dailmer to consider opening HERE data and also to enable user editing of the data. Matt Amos explains why he feels that the proposal is not particularly constructive. Wikipedia is attempting to identify vandalism and other types of bad edits by deploying ORES, an AI-based system. Mapzen has introduced three new pretty styles based on their Vector Tiles service. GPS Business News spoke with the head of sales at Navmii during WhereCamp. The interview with the representative of Navmii ( claims to be the provider of the first smartphone navigation based on OSM data) is about their prospects for 2016. A Google mapper is annoyed and frustrated with the difficult process of mapping a new freeway interchange using Google Mapping tools. He points out that (at the time of writing) OSM had “nailed” this interchange and Google Maps were a long way behind. Maybe interesting for mapper whitechristmas: here the probability of a white christmas in Europe. The Zooming in on History website shows a collection of historical maps for the USA. This blog entry provides some background information. World’s first holographic navigation system arrives for U.S. Drivers. Note : If you like to see your event here, please put it into the calendar. Only data which is there, will appear in weeklyOSM. Please don’t forget to mention the city and the country in the calendar. And to be clear: scanaerial is a very useful tool, it just needs to be used carfuly.